Are you? Househunting? 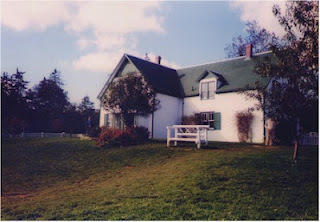 If so, you might be interested to hear that the Lucy Maud Montgomery Museum is for sale. Yes, that is Lucy Maud Montgomery as in the author of Anne of Green Gables. And guess who has been there?Yes, that's right. Me. It turns out that I can't give you a lot of inside scoop on this prime piece of real estate, the asking price for which is supposed to be $349,000. I can only give you a little bit of information on the surroundings. It appears that I only took one interior picture when I was at the museum, and, sorry to say, it was not of the kitchen. And, you know, kitchens sell houses. I have no recollection of the kitchen at all, which is most unusual because I love looking at old kitchens. 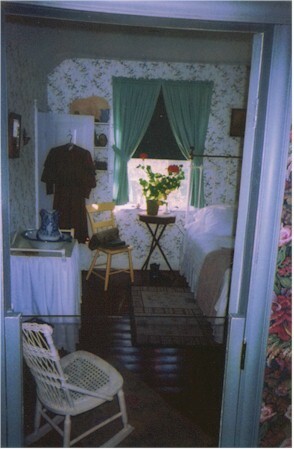 This is a bedroom that I believe was done up to look as if it could have belonged to one of the characters in the book. A female character, I'm guessing from that dressie looking thing hanging on the wall. I don't know how much property comes with the house. At the time I was there, the grounds included the Haunted Woods Trail, which my walking journal indicates is .8 miles. The notes in my journal also say that the trail was the inspiration for the Haunted Woods in Anne of Green Gables. No idea where I got that info. I don't even remember the Haunted Woods in Anne of Green Gables. 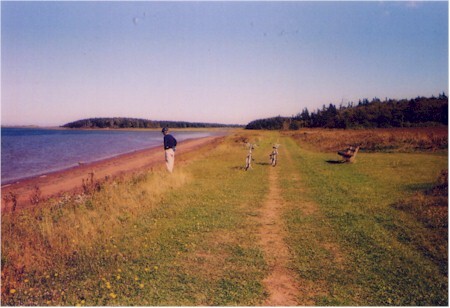 Prince Edward Island, the province in which the museum is located, is, indeed, an island. It is accessed by one serious bridge. I mean, a whopper. At Chez Gauthier, we are fond of big bridges. The bigger the better. Tolls do not deter us. 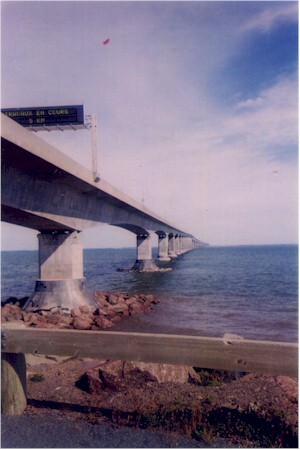 In fact, knowing that we were going to have to go over the Confederation Bridge to get to P.E.I. was a real draw, as far as we were concerned. And we got to go over it a second time on our way home! 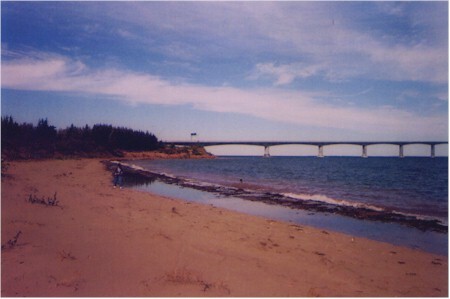 I guarantee you, we have more bridge pictures than we do Lucy Maud Montgomery Museum pictures. The day we visited the museum we picked up a biking trail somewhere nearby. Again, quoting from the walking journal (which also doubles as a biking/skiing/canoeing journal): "5.9 miles. Maybe the best bike ride we've ever been on. A great mix of meadow, woods, beach, ocean views. It was fantastic and not difficult, either." Not difficult is always a big plus for me. If you're going to go look at the house, bring a bike. So there you are, a little information on the Land of Anne, where the Montgomery home is located.